Do you love to mow grass? Do you take the appearance of weeds as a personal insult? Then you are suffering from Lawn Addictive Disorder (LAD). 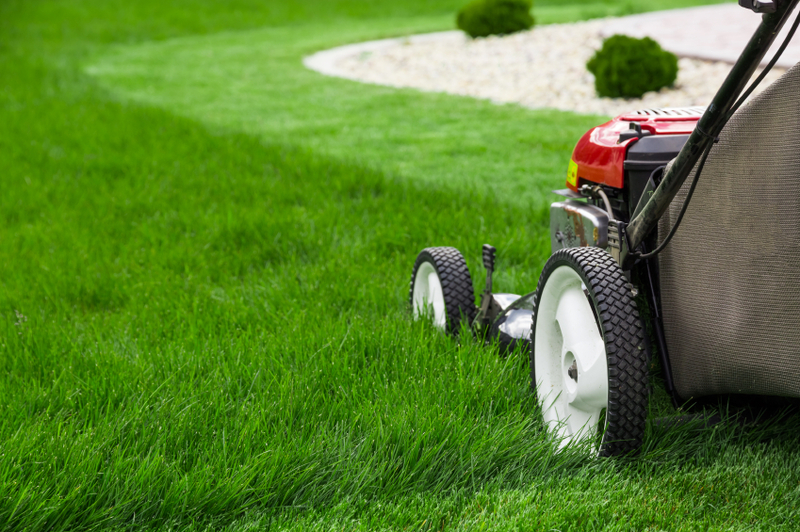 As a part of an ever-growing (but silent) community of lawn obsessed homeowners, you are chomping at the bit to fire up your lawn mower. We are here to help you manage these impulses and get ready for your favorite pastime. Forget baseball season, it’s mowing season! If you are a lifelong LAD sufferer, you spend a great deal of time stressing over the condition of your lawn. Grass doesn’t have to be a source of anxiety. If managed correctly, you will be cutting patterns across your lush sod soon enough. Let the soil dry out – If your area receives a lot of rain and snow, let the soil dry completely before working it to avoid further compaction. Test the soil – This helps determine the best fertilizer to add to soil. For more on the different supplements available, Get a Head Start on Spring Gardening with Fertilizer gives helpful suggestions. Find the right time – Avoid rushing out to mow your grass right away. Allow it to grow to at least two inches before cutting it back by a third of the desired height. Use a mulching mower – Adding grass clipping back to your lawn provides it with 25% of the nitrogen it needs. Don’t leave large clumps of clippings in your yard. It will kill the grass underneath and invite pests. Sharpen mower blade – A dull blade will stress the grass and encourage disease. Nitrogen helps grass build strong roots and lush leaves. Apply a nitrogen-rich fertilizer in early Spring to encourage growth and then again later to help sustain it through the Summer heat. Water at least one or two days following an application to make sure it gets to the roots. Remove thatch – This layer of dead grass and weeds can choke the root system. Rent a dethatching machine to remove it and rake up the debris. If your grass shows signs of disease, don’t add the clippings to your compost pile to avoid spreading them. Aerate or plug – Aeration machines pull plugs of grass and soil up allowing air, moisture and fertilizer to get to the roots. This helps soil that has been compacted during Winter. Evaluate your soil – What your grass is planted in matters. Enhance your soil’s health by feeding it a layer of compost after you aerate. Work the organic matter into the plug holes with the back of a rake or stiff broom. Water regularly – Allow your grass to dry out (almost wilt) between each watering. It will encourage the roots to grow deeper and tolerate drought better. Give grass at least one inch of water weekly. Face it, weeds happen. The best defense is keeping your grass healthy. A strong root system crowds out weeds. This is the best time to tackle weed issues, before they take over. Different weeds require different products. Ask your garden center for advice. Some herbicides like Round-up will kill everything (grass, flowers, even pets) so be careful when using. Spot treatments – Apply herbicide to broadleaf weeds. Spray dead spots with a fungicide early before it spreads. Thatching will help prevent this. Dial sprayer – When the weed problem is widespread, add a dial sprayer to your hose to administer the herbicide over a wide area. Protect flowers and shrubs with plastic when you apply. Broadcast spreader – Prevent crabgrass by applying a granular weed killer early in the Spring. Dig them out – Sometimes the old ways are best! Use a garden knife to dig dandelions and creeping buttercups up by the roots. Living with your lawn obsession is possible, if you practice good grass maintenance. Make it your objective to enjoy your yard, not stress over it. Set your sights on loftier goals like cutting the pattern of your favorite baseball team into your front lawn. Your homeowner’s association will love it! From rakes and Honda mowers to dethatchers and aerator/pluggers, our expert staff is ready to help you with your lawn obsession. Do you need to re-seed your grass but are not sure how? Our blog, 3 Options for How to Replant Grass in Your Yard, has helpful DIY tips on the best method for you. As always, if you have any questions about what to choose, pricing or how-to’s, don’t hesitate to contact us. Stop by our store — we’re open seven days a week.